Cosnach is a drunken Breton warrior who is usually found at the bar in the Silver-Blood Inn. 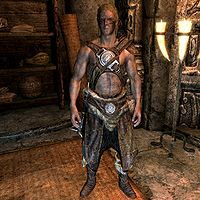 He is a porter for the Arnleif and Sons Trading Company, which can be found directly across the path from the Silver-Blood Inn. Cosnach thinks himself a good worker, but his employer, Lisbet, complains about his constant drinking and says the only reason she doesn't fire him is because his cousin Imedhnain is her assistant. He claims that the reason he spends all his time drinking is the multiple Forsworn raids on supply caravans, hurting business. Cosnach gets up at 8am, and proceeds straight to the Silver-Blood Inn, where he spends the next 16 hours drinking. At midnight he will finally stop drinking and walk to his bed in the Warrens to sleep; before repeating his schedule the following day. You can offer him an alcoholic beverage for which he will be grateful. If you accept his offer of a brawl and win, he will become an available follower and can be recruited for the Blades. He also becomes a potential marriage partner. Cosnach wears a set of hide armor and a matching pair of boots. He is equipped with an iron mace, and carries a key to his room as well as a selection of lower-class loot and gold. If you ask him where he works, he will reply, "Arnleif and Sons Trading Company. I'm a porter. Just some muscle hired to move heavy packages. But we don't get any shipments in. Forsworn attack every caravan. So all I do is sit here and drink." 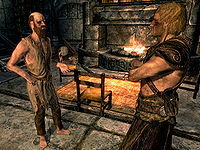 If you ask him about Margret while he is in the Silver-Blood Inn during The Forsworn Conspiracy he will say "Oh yeah. Pretty little thing. Been sitting by the fire all day." if she is alive, or "Oh yeah. Pretty little thing. Had a room here I think. Ask the innkeeper." He may remark on his job problems, saying ""Check the shipments" Lisbet says. "There are no shipments" I says." or "There's no shipments coming in, so I do nothing. Just drink." or "No breaks for a good worker out here." He will exit conversation with "I think I'm going to get another drink." Degaine: "Give us a coin, Cosnach. You'll just spend it on cheap ale, anyway." Cosnach: "Like you won't do different?" Degaine: "I'm a cripple. I have a reason to be drinking." Cosnach: "And I'm a porter with no shipments coming in. You're not getting any coin from me, Degaine." Cosnach: "How did you manage to cripple yourself, Degaine?" Degaine: "Mining accident, back when I was in prison for being a pickpocket." Cosnach: "You're lying. You're not quick enough to be a pickpocket. What's the real reason?" Degaine: "Fell off the top of the cliff after a drunken party with the priestesses of Dibella." Cosnach: "I don't buy that story, either." Degaine: "Too bad. That one's my favorite." Kleppr: "Another drink, Cosnach? A porter with Arnleif and Sons deserves nothing but the finest here." Cosnach: "All your drinks are watered down, Kleppr. You aren't fooling me, and you know Lisbet can't afford to pay me enough for the finest drinks anyhow." Kleppr: "I wasn't aware that Lisbet was having trouble, Cosnach. Is Arnleif and Sons not doing a good turn of business these days?" Cosnach: "What are you, blind? That store is empty. Forsworn get almost every shipment that comes in." Kleppr: "That's just terrible. I'm so sorry to hear that." Although his default gear is light armor, Cosnach is actually more proficient in heavy armor. This issue has been addressed by version 2.0.4 of the Unofficial Skyrim Patch; his class is changed to be more proficient in light armor.